The Denver Police Department’s Crowd Control Manual, as well as Department Directive 11-07 to which it is attached, have, as far as we know, not been available to the public until today. 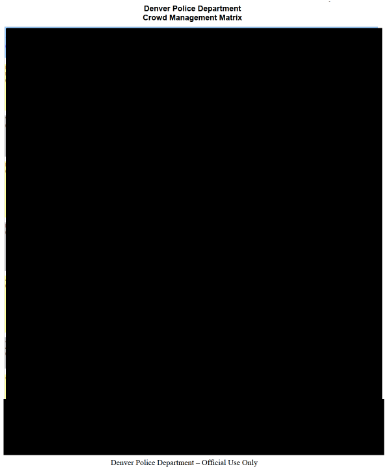 After requesting these documents under the Colorado Open Records Act, we received a heavily redacted copy on January 19th, 2016. It is worth noting that Department Directive 11-07 is dated October 19, 2011, just five days after the first eviction of the Occupy Denver camp on October 14. Denver’s Office of the Independent Monitor issued a report specifically criticizing the heavy-handed tactics used by police during this time period. At 41 pages long plus Appendix A, B and C, the Crowd Control Manual was sent to us with even a portion of the “Table of Contents” redacted. 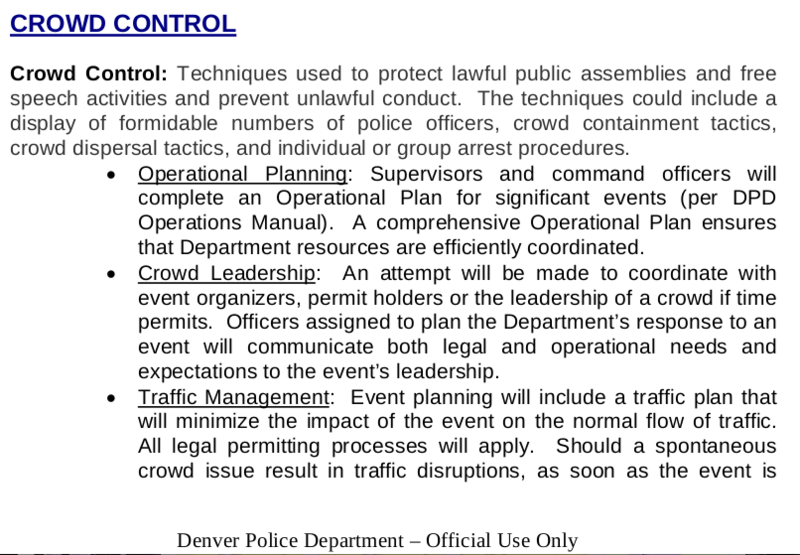 Denver’s Crowd Control Manual has the operational standards to dealing with “Crowd Management”, how they define “Crowd Control” (pictured below from pg. 6 of manual), and how and why to use weapons and force against a crowd of citizens. 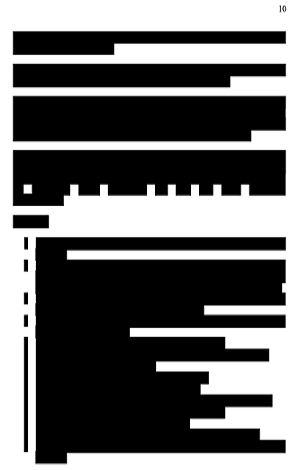 The manual’s “General Rules” were essentially unreadable to the citizens of Denver, as this section was wrought with redactions. 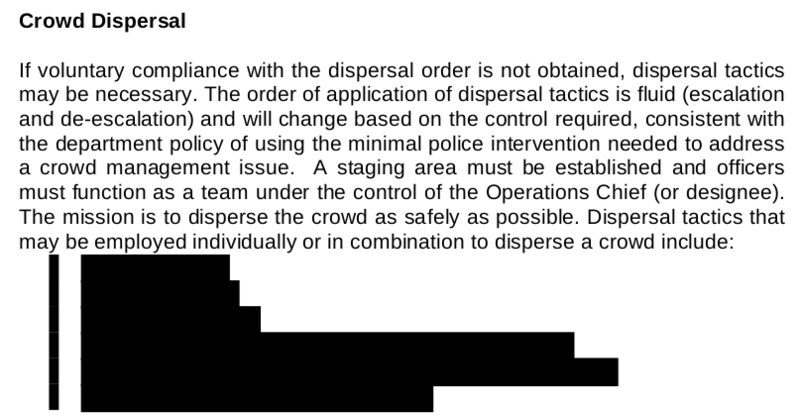 Seen throughout most of the manual is a paragraph explaining a topic and when it comes to any specifics of that topic, there seems to be redactions as pictured below from the “Crowd Dispersal” section on page 14 of the manual. 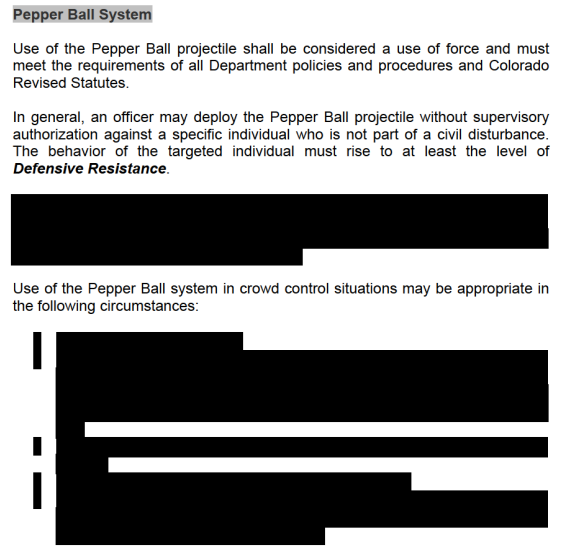 More instances of the detail redactions appear when you look at the screen shot from page 19 under the section of “Use of Force Options”, where, again, the circumstances to which an officer can use the “Pepper Ball system” are redacted. 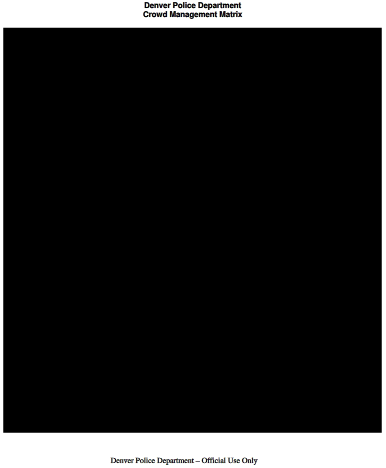 Upon getting deeper into the manual, some of the heaviest redactions start out in the “Crowd Management Matrix” section, which “outlines several strategies and tactics that may be used to address the unlawful behavior of individuals or groups.” Below is a screen shot of the language surrounding the “Matrix” and three pages of the subsequent “Matrix” itself, all redacted. 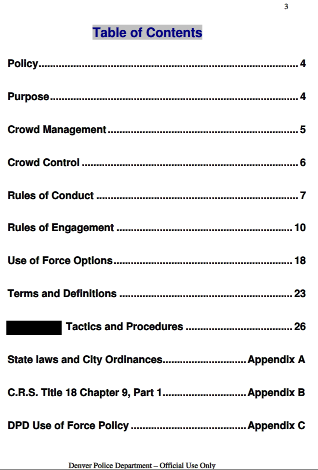 The number of redactions in the release of the Crowd Control Manual of the Denver Police Department clearly point out that the Denver Police do not view its citizens as civilians in the sense that redacting simple procedures from the public’s view shows the level of secrecy the police entitle themselves to, and per their secrecy deeming the public as a continual threat. 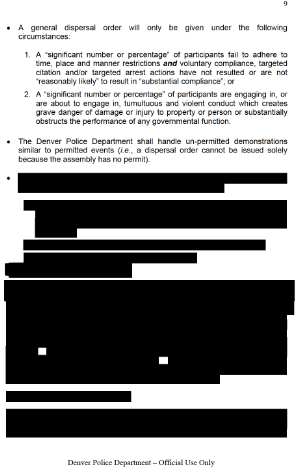 This document release is part of an ongoing series of investigations into the policing of social movements in Denver. Using open records requests and other investigative methods, we are compiling reports and stories documenting the Denver Police.